Some people have everything figured out—Andrea Nash is not one of those people. By now, you all know just how much I love Ilona Andrews and their amazing writing, which has got to be a superpower of some kind. I fell in love from the first page of MAGIC BITES, the first Kate Daniels novel, and they will forever be on my must-pre-order list so that the book shows up on my doorstep as soon as possible. I've raved about The Edge series already but today I'm talking about a book from the series that is one of the best urban fantasy series to date. One of the reasons I was so excited for GUNMETAL MAGIC, aside from the fact that it's another exciting story for Ilona Andrews, is Andrea herself. Ever since she appeared on the page, I've been rooting for her. She's been through so much, personally and professionally, and she's always been one of my favourite characters in the series. Andrea's smart, brave, and loyal, and a total badass to boot. Of course, she'd be no fun if she were perfect, which is why she's delightfully flawed -- she's got major conflict over her shapeshifter nature because she's beastkin, meaning her father was a hyenawere (born a hyena, able to shift into a man), making her a pariah in the shapeshifter world. At the same time, she's mated to Raphael, the alpha of the bouda (werehyena) clan but they've broken up because she stayed to serve the Order when the Pack was in danger, and she's been forcibly retired by the Order once she was outed as a shifter. So. Much. Internal. Conflict. I love it. I also love Raphael. He's provided a lot of comic relief and serious fight skills over the series and it's great to see him front and centre in GUNMETAL MAGIC. It's especially great to see Raphael and Andrea forced to work together to solve the murder of four shapeshifters who were working for Raphael's company. It forces them to deal with all of their baggage, as individuals and as a couple, in a way that will delight the reader while stressing out the protagonists. The murder mystery is also well developed, with the book taking all sorts of unexpected turns. I was completely hooked, waiting to see who was behind the murders and how Andrea and Raphael would resolve it. 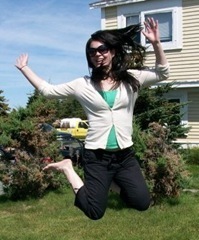 Many of Andrea's issues are also resolved (to a degree, in some cases), which was quite welcome. Kate Daniels fans should run to the stores to get copies of this book. 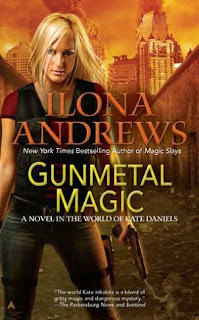 GUNMETAL MAGIC is a must-read urban fantasy with great action, wonderful characters, and dry wit. Folks new to the series would be better off going back to MAGIC BITES since events in previous novels are referenced in GUNMETAL MAGIC, and it'll give you a better handle of the world and its inhabitants. But even if you don't, you're sure to enjoy GUNMETAL MAGIC as a stand-alone kickass story! I agree I also loved this book, it was really nice to learn more about Andrea and you're right, Raphael is amazing! Great review, I also love all of their books. Oh I have this one here waiting for me as well. :) I will say ever since The last magic book, I've loved how Andrea has come to the forefront. Great character and glad she got her own book. :) Look forward to readingit.